Nearly all martial arts have a system whereby a student can progress in their style. It is measured by examination at set intervals. Below the black belts are Kyu grades, meaning level, and normally starts at white belt, 9th Kyu (KuKyu). 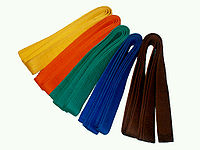 Each style will have their own coloured belts to recognise this, but may differ from school to school. Thereby the best way to compare the level a student has attained is by their kyu grade, and not the colour of their belt. For example, a 5th Kyu student in Anshin Ryu Karate wears a Red Belt, while a student of Matayoshi Kobudo wears Green Belt. Furthermore, some martial artist start at a lower kyu grade than others, i.e. perhaps at 6th kyu instead of 9th kyu. However, once the student becomes a Black Belt then only difference is in their Dan (meaning Grade) level. They progress upwards, such as 1st Dan, 2nd Dan, 3rd Dan and so on. This can be identified normally by either stripes across the end of their belt, or circles etc. Within this system titles are given, such as Kaicho (Master of the dojo), Soke (Master or founder of the system), and Shihan (5th Dan or higher); their are more of these titles and all are awarded. Below are the belt systems for the schools of Karate and Matayoshi Kobudo in Kodokan Martial Arts, and the minimum time a student needs to put in before attempting their next belt. The time between grades are based on the amount a student spends in the dojo. A lesson is between 1 to 1.5 hours depending on the class.